Niagara Falls, NY - Ron MacDonald, a captain of the Maid of the Mist for 30 years, is looking forward to the beginning of the 2018 tourist season. Crews are getting the boats ready to take on passengers this Friday. Now that the ice run has cleared the Lower Niagara River, final preparations are being made to launch the Maid of the Mist’s 2018 season, the 133rd consecutive season for one of North America’s longest running tourist attractions. 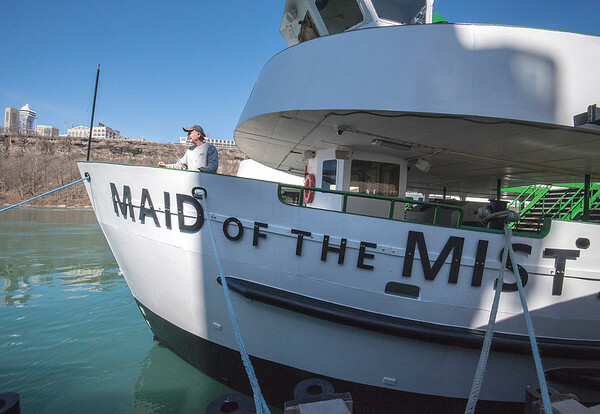 Maid of the Mist VI and Maid of the Mist VI will welcome passengers on Friday, Apr. 27, at 9 a.m. Departures are available only from the Maid of the Mist landing in Niagara Falls, New York. The season runs through Nov. 4. In 1848, Maid of the Mist I, a side-steamboat ferry with twin smokestacks, could carry a stagecoach and horses across the Niagara River. In 1848, construction of a suspension bridge curtailed business and Maid of the Mist was re-branded as a sightseeing adventure. A combination of factors led to the suspension of service until June 13, 1885, when a new Maid of the Mist boat ventured closer to the Horseshoe Falls than any boat ever had. Service has continued non-stop for 133 seasons. Today, Maid of the Mist VI and Maid of the Mist VII can accommodate as many as 600 passengers. Beginning Apr. 27 through May 18, tours will operate 9:00 a.m. to 5:00 p.m.
(weekdays) and 9:00 a.m. to 6:00 p.m. (weekends). Adult tickets are $19.25; tickets for children (6-12 years) are $11.20. Children 5 and under ride free with an accompanying adult.